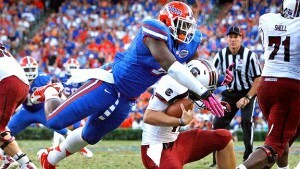 Jacksonville Picks Dante Fowler Jr. DE, and man what a turn around this team is making year after year. Here's our analysis and some video highlights of Dante Fowler. Dante improves a struggling defense that ranked 7th worst overall last year. I like what the Jags are doing and it's possible that they could be a playoff contender within 2 or 3 years if they continue to build a solid team like they have in recent years. STRENGTHS Well-built, athletic frame with very long arms. Has transformed body since coming in, losing 25 pounds while adding substantial explosiveness in space. Versatile -- was moved around field for Gators. Can rush from two- or three-point stance. Good first-step quickness. Uses improving spin move to counter when rush stalls high-side. Can dip and turn corner against upright tackles. Slants inside with devastating quickness. Well-timed arm over to whip lungers. Rangy in pursuit. Has hips and feet to change direction seamlessly. Can chase play-side running back to sideline and terminate with very little angle. Length to stifle cut blocks. Strong hands and arm extension to set edge and maintain. WEAKNESSES Bounced all over the field. Raw pass rusher. Still learning nuances of the position. Needs more coordination between hands and feet. Pass-rush approach lacks efficiency and includes too much wasted motion. Expected "speed-to-power" conversion inconsistent on tape. Tackles with length can lock him out and run him over the top. Average lower-body strength with limited window to fend off power. Limited recovery talent when beaten early in snap. Inconsistency against downhill running game is a concern.